There was a time in fusion history when the hopes of harnessing the power of the stars rested on a device aptly called a "stellarator." Shaped as a figure-eight torus, the stellarator was the brainchild of a 37-year-old American astrophysicist named Lyman Spitzer. 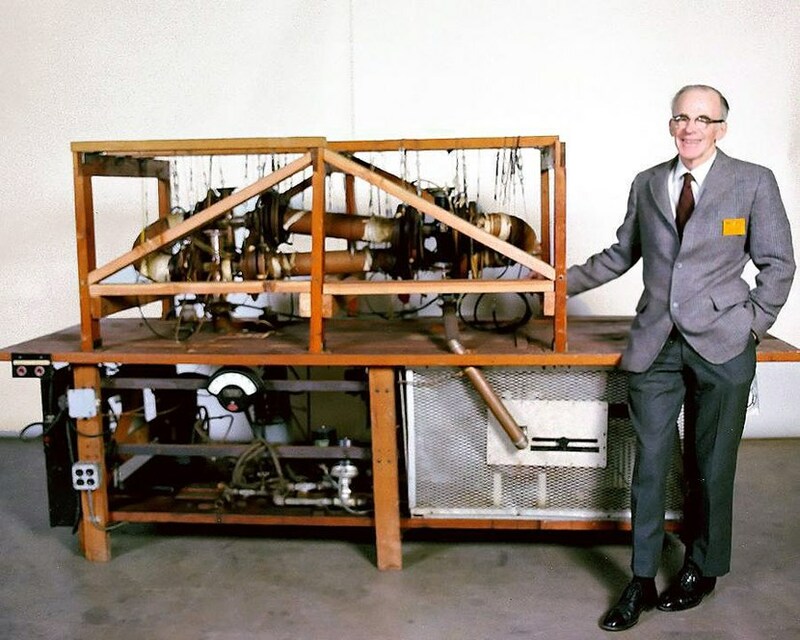 Lyman Spitzer (1914-1997) had a revelation for the stellarator design in 1951. Less than two years later, the figure-eight ''Model A'' was operational at the newly founded Princeton Plasma Physics Laboratory (PPPL). How Spitzer had a revelation for this particular design belongs to the legend of fusion. It all came to him as he was skiing in Colorado, pondering the claim that an Austrian scientist, working for Argentina's strongman Juan Perón, had just produced "the controlled liberation of atomic energy" through the simplest and lightest of all elements, hydrogen. Argentina's claim was soon to prove a hoax. But Spitzer's concept, born on a ski slope in early 1951 and turned into an operational device (the "Model A" stellarator) in the fall of 1952, was to rule supreme among fusion devices for almost two decades until it was dethroned by a Soviet invention ─ the tokamak. Soviet physicists began developing tokamaks in the late 1950s. By the end of the following decade, the performance of the Soviet machines was a full order of magnitude higher than any other fusion device. As the tokamak concept took centre stage, stellarators were abandoned or transformed into tokamaks. And the tokamaks, for their part, became more promising as they progressively grew larger and more powerful. Yet stellarators still had their aficionados, and in the late 1980s—thanks to spectacular progress in computer-aided design, automation and engineering techniques—the stellarator was given a second chance. At the Max Planck Institute of Plasma Physics in Germany, the Wendelstein 7-AS entered into operation in 1988 and pursued a brilliant career until 2002. Japan followed suit with its Large Helical Device (LHD), which celebrated first plasma in 1998. In the US, a small stellarator—the Helically Symmetric Experiment (HSX)—was built at the University of Wisconsin at Madison in 1993 and a much larger device, the National Compact Stellarator Experiment (NCSX), was launched at the Princeton Plasma Physics Laboratory in 2004 only to be cancelled four years later by the US Department of Energy. Now, almost 65 years after Spitzer's skiing trip to Colorado, a new age may be dawning for the stellarator. In northern Germany, the successor of Wendelstein 7-AS, dubbed "7-X," is on the verge of entering operations. The German machine, in the words of science writer Dan Clery (in Science), looks "a bit like Han Solo's Millennium Falcon, towed in for repairs after a run-in with the Imperial fleet." Contrary to tokamaks, with their symmetrical and rather straightforward architecture, stellarators rely on a complex and baroque arrangement of twisted coils to confine the plasma inside the machine's vacuum chamber. The essential difference between a stellarator and a tokamak is that a tokamak has a central solenoid which induces current in the plasma that twists the magnetic field lines and increases plasma stability. 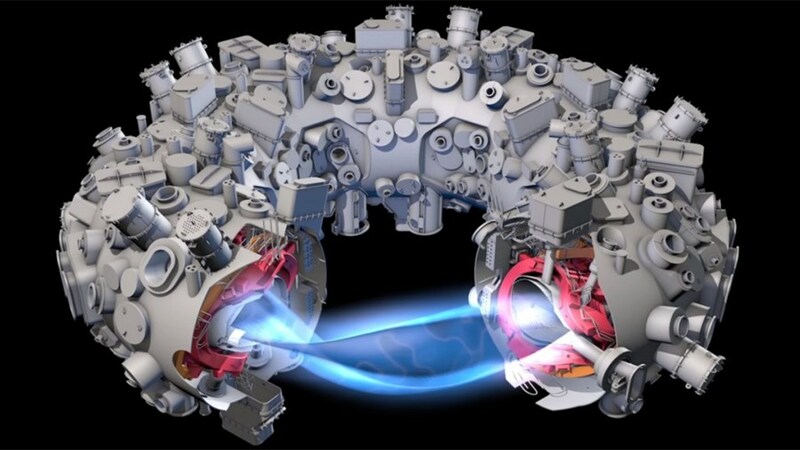 In contrast to the tokamak device, a stellarator has no central solenoid, there is no current driven in the plasma. The twisting of the magnetic field lines is created by complex shaped external magnetic coils instead. This configuration gets around many of the difficulties encountered in tokamaks, however, significantly complicates the design and construction of such a device. "This extremely complex geometry and the manufacturing challenges it generates are the main drawbacks of stellarators," says Rem Haange who was Technical Director of Wendelstein 7-X from 2005 to 2011 before becoming Deputy Director-General and Head of the ITER Project Department at the ITER Organization. But stellarators have an advantage ─ they are inherently stable. In a Newsline interview in 2011, Thomas Klinger, who heads the Wendelstein 7-X project, used the following image: "In a stellarator, confining the plasma is like holding a broomstick firmly in your fist; in a tokamak, it's like trying to balance the same broomstick on your finger." In a few weeks, the German machine will demonstrate how well, and for how long, it can hold the broomstick. Rem Haange is confident. "The design of Wendelstein 7-X was driven by how to improve plasma confinement. We concentrated on how to minimize particle loss and, according to computer models, the machine should meet our expectations." Does that mean that stellarators will one day provide an alternative to tokamaks? In the timeline of fusion devices development, Wendelstein 7-X stands where JET (the largest operating tokamak today) stood 32 years ago ─ a promising device whose size and technology will open new territories to explore ... but still a long way to an industrial-size installation like ITER. In the longer term, all will depend on Wendelstein 7-X's results. "After all, we have developed both diesel and petrol vehicles and they both perform to our satisfaction," says Haange. "It's possible to imagine a future where stellarators and tokamaks cohabit in harmony."